Jams with 2 pages jams with 10 pages.I basically have to sit here and babysit the scanner the whole time.I could scan my documents faster one page at a time on a regular scanner.Returning it as we speak. Great software, little jams, but crooked scans! This Xerox scanner is a decent buy if you have hundreds of pages to scan.I have scanned thousands of sheets through mine, with little trouble.Xerox even includes a replacement part for the feeder, which I have yet to need.This scanner has allowed me to tackle a project I would not have done otherwise, it has paid for itself many times over.The included software (PaperPort/TextBridge) are excellent!The only reason this scanner did not get 5 stars is that nearly every scan is crooked from the feeder.The software has features to correct this skew, but it is a bit time consuming. When it works I've been happy with this scanner.It often just hangs after a paper jam and there is no way to reset it, short of power cycling and starting all over again.This is very annoying on large documents. I've had great experiences with this scanner connected to Win XP, using the ADF to scan 50 pages at a time without problems.Unfortunately I just bought a iMac G5 desktop & discovered that there is no Xerox support for Mac OS X !So I will need to keep using my Windows laptop if I want to scan....otherwise a fine product. This scanner works, most of the time.I am moving toward the (still distant) paperless office, and this scanner has gotten me much closer.However, I can't recommend purchasing one because it has some maddening problems that just don't seem to be tractable. The DocuMate 510 doesn't work at all with Windows Server 2003, because apparently corporations don't need to scan documents. On Windows XP, it provides both TWAIN and WIA drivers.In my case, I can choose between the TWAIN driver, which inverts the colors of all black and white scans (the option to correct this simply doesn't work on my PC), and the WIA driver, which ignores the auto document feeder, forcing me to babysit the machine while it scans.I've worked around this in Microsoft Office Document Scanning with a greyscale scan that converts to black and white, but that slows it down from its rated 10ppm to about 3. The Documate 510 software bundle includes (indeed, centers around) PaperPort 9 Deluxe, which allows scanning to PDF.Despite the "Deluxe" this product is crippleware, designed to entice you to buy the "real" version: PaperPort Pro.Except PaperPort Pro is now at version 10, which isn't really compatible with this scanner, due to the driver problems mentioned above (which are pervasive no matter what application is used, except the shipped version of PaperPort 9 Deluxe appears to have some kind of workaround). I've tried several times to reinstall the drivers in the hopes of correcting some of these issues.Doing so requires on-the-spot "registration" every single time, including typing in the 20-character alphanumeric serial number from the back of the unit.As an added bonus, it requires you to enter your email address and subscribes you (with no indication that it is happening) to Xerox's marketing email list. I believe this scanner is actually made by Visioneer, who sells or sold it under another name (4650?) and OEM'd to Xerox as the Documate 510.The "beauty" of OEMing a product made by someone else is that you can take it to market without a single person in your organization knowing how it works.This certainly appears to be Xerox's approach, as evidenced by the product's second-class citizen status on their website and their support personnel's inability to deviate from their call scripts. So the Documate 510 does work, sort of.I have scanned quite a bit of material with it; my complaint is that the experience is inevitably much slower and far more frustrating than there is any need for it to be. 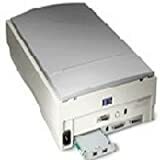 The Xerox DocuMate 250 Scanner is a compactand effective hi-speed scanner perfect for workgroupsand other decentralized scanning applications.By eliminating seldom used optionssuch as duplex capability and a SCSI interface,Xerox offers this model at a price that enablesbusinesses to achieve high levels of productivityby distributing fast cost-effective scannersthroughout the organization. The DocuMate 250 has a 50-page AutomaticDocument Feeder that scans 22 pages perminute (221 ppm). It features 600x1200 dpioptical resolution, 48-bit color, Hi-Speed USB2.0 interface and scans everything from checksand photos up to legal-sized documents. 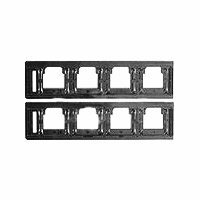 It alsofeatures one of the smallest footprints availableof any ADF scanner on the market. The DocuMate 250 includes TWAIN andCertified ISIS&reg; Drivers plus the followingsoftware. PaperPort Pro 9 Office is the easiest way to turnvolumes of paper or photos into organized digitalfiles that you can quickly find, use and share.PaperPorts native support for the standard PDFformat brings you the power to scan, annotateand email documents and photos in a format thatensures everyone can view and print them on anycomputer. Stop wasting time looking for paperdocuments scattered around your home and office. TextBridge Pro 9.0 quickly turns scanned documents into editable,formatted text. You can use the text in virtuallyany word processing, desktop publishing, orweb publishing program. This product fairly reeks of the "rush to release" syndrome. The instruction manual comes with several separate "Errata" sheets attached, correcting misinformation inadvertently printed in the manual. If you use this scanner, you can't have any drivers for any other Visioneer scanners on your computer, which is frankly ridiculous -- for a scanner that costs $1000, you'd think the software engineers could devise a driver that doesn't cause such problems, especially since many people own more than one scanner. What's worse, they're not kidding -- I uninstalled the Documate driver and returned the scanner for a refund, but I still can't get my other scanners to work, because the Documate software screwed them up. This scanner is way too much trouble for the money. I wish I'd never heard of it. Update -- 4/2005 -- if you're looking for a duplex scanner, you're better off with the Fujitsu FI-4120C2. I found it, and it's excellent. I have to scan medical documents, sometimes 4 or 5 at a time, to .pdf.Interfacing with Acrobat 6 was a problem at first, but Acrobat 6 Prof and Standard have an update, 6.0.2, and after that, I had no problems.This machine is FAST.Zip, zip, zip!Done!The software interface is simple and unobtrusive.I use a program, MacroExpress, to facilitate the process,and this is the only software I've used (two others so far) that adapts almost pefectly.The warmup time was a problem for me in the past.I dictate reports, then attach other documents to the finished products.If one inserts the sone-to-be scanned documents in the scanner as one is nearing completion, it warms up, and by the time I'm ready to scan, it's over in a matter of seconds.I spent a significant amount of time searching for the best if not perfect scanner.This is it. The product support was friendly and good, and I didn't have to wait too long to talk with someone when I was having trouble with the Acrobat 6 interface.Coming from a flatbed scanner without auto document feeding, I feel like the ape in the beginning of 2001 Space Oddessy, my leg bone just morphed into a space station. Scans film and transparencies up to 12" x 16"
Getting your film and transparencies scanned correctly can be a pain. That's why you need a transparency adapter like this one from Epson. 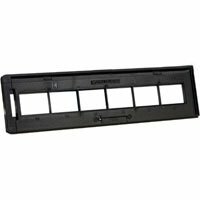 Designed to work with your Epson 10000XL scanner, the adapter accepts positive or negative 35 mm film or medium format transparent media up to 5 by 4 inches. Its 11.4-by-16.4-inch size fits perfectly on the 10000XL's scanning surface and helps you get perfectly aligned scans every time. Batch scanning is a snap, as the adapter can hold up to 48 35mm negatives, 30 35mm slides, eight 4-by-5-inch transparencies, and up to six medium format transparencies. 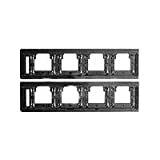 This moving carriage type transparency adapter also features Epson's high-quality lamps for faster film scanning. Designed for convenience and quality, the adapter also comes backed with a one-year limited warranty. 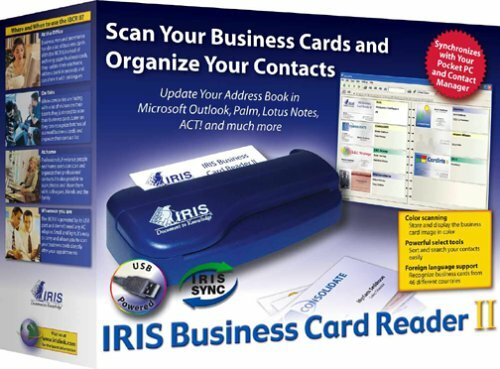 IRIS Business Card Reader is an easy way to input your contacts into your computer. Simply slide a business card into your scanner and in seconds the information is automatically transferred to your contact management database. IRIS Business Card Reader will help you keep your contact database up-to-date and it relieves you of the tedious task of having to type card information into your computer. If you'd still like proof that the average human mind doesn't think in any manner resembling a computer's processor chip (even those computers we love that help us "think different! "), attempt to comprehend the challenge in how a computer "reads" a sheet of paper. You and I read an article in the newspaper, skip over to a eye-catching advertisement, pull out our wallets and exchange business cards, and all the time, we have learned to scan the item of interest, pick out those words that are important, discard the rest as unnecessary, and go about our busy lives. But not a computer.A computer lives for those details.And those same details can mire a processor down. I initially looked into this review by getting my hands on the Business Card Reader (BCR) device, in this version, roman number II, so that I might make my life easier by managing the growing pile of business cards that I collect, and have collected over the past decade, and expect to continue to collect well into the future. There is something wonderful indeed about business cards, especially in how succinct the summary of a person's relevance.But I digress away from attempting to deal with this growing pile of cards. Card files don't seem to work for me.But I have enjoyed manually inputting some of my more frequent contacts into Address Books (both Apple's version and Microsoft's Entourage version. )So it seemed an obvious step to begin to input the business cards using a Business Card Reader! 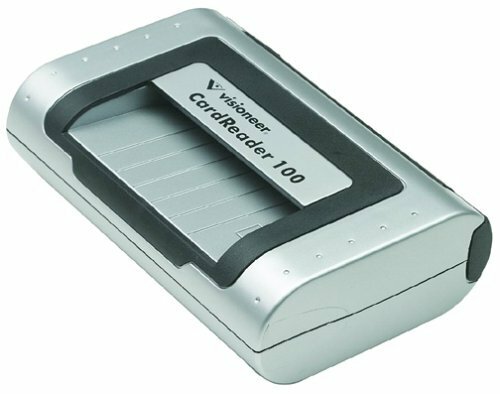 I will warn you -- skip the software that comes "standard" with the current Business Card Reader II.An upgrade is promised, but in the meantime, consider using another ReadIRIS product -- Pro 9.0 (in my case, I tried the corporate edition). ReadIRIS Pro is a joy to work with.The install was smooth and easy.The software engine (with all files and reference information) installed in less than 80 megabytes.I thought that quite good, especially with how the software promised to handle so many different fonts and language styles. I tested the software with both a Hewlett Packard scanner and the BCR device.Switching between the two was very quick.I can see how the OCR software could pay for itself due to some of the vast amount of reference materials still unconverted to digital format (the software outputs in text, rich-text, html and pdf formats).Keep in mind however to put aside some time to proof your new documents against the old.If you have a set of material which needs OCR review, one of ReadIRIS Pro 9.0's benefit's shines -- the work you do to input corrections into a dictionary format can help similar documents in basic recognition of font and language skill. In order to get back to my original project of dealing with my card piles, I was able to get cards read into Entourage's address book in an average of 3 minutes per card.I'm not too quick at typing, but I might have entered them only slightly faster just by doing it all manually.But -- I haven't done this over time.And, I was sort of mesmerized by watching the scanner process my business card stack.That is the fast part.The other portion of the three minute average was spent looking over the scanned data (automatically exported from ReadIRIS Pro 9.0 into Entourage) and "proofing".I was very impressed by the quantity of correct data, even with "pretty" photograph enhanced business cards. My business card organization project will be ongoing.But now I have a much better tool set. The adapter worked flawlessly for me for about 3 weeks, scanning about 55 APS films, mostly with 25 exposures but a few were 40-exposure rolls. While scanning the last 10 of those films a squeaking noise developed and worsened, but I ignored it because the scans did not have problems. Finally the adapter choked on a 40-exposure roll. The motor made a high pitched whining noise, like some gears had stripped or something. I did manage to open the door and get the roll out. That roll had a couple creases in it. There is something rattling inside the adapter. I have returned it to Nikon for warranty service. I still have about 45 rolls to go after I get the adapter back. I hope that this failure is not indicative of the normal usable lifetime of this adapter. Because I'm not sure about the expected lifetime, I wouldn't advise buying a used adapter. Setup was painless,i was scanning 5 minutes after i opened the box.A "must have" for any BJC-85 owner. I've seen several other companies try to produce portable printers or scanners and they have all fallen short of the Canon BJC-55/85.One main reason is this little device that allows you to carry both at once!The software is extremely easy to use.In part because there are no settings to change; you can only ever scan at 300 dpi (most flatbeds have much higher resolution, thus my rating of 4 stars). I use this scanner primarily for text documents and couldn't be more impressed.You do need text software - I have Textbridge - but I find relatively few errors in the scan, proofreading and corrections are easy and efficient.Best of all, I don't have another device plugged into my computer or taking up space on my desk.Caution - I haven't used it for photos, but it does a great job on text. Visioneer, a world-class developer in the document imaging market, offers the ultra-slim, ultra-mobile Visioneer OneTouch 7300 USB color flatbed scanner with the ability to scan up to 1200 x 1200 dpi in 48-bit color. The OneTouch 7300 USB scanner's slim design, USB bus-powered capability, and hinged lid provide maximum portability and scanning versatility. In addition, the OneTouch 7300 USB scanner's suite of bundled document and image management software offers mobile and small office professionals a complete, easy-to-use mobile scanning solution. The OneTouch 7300 USB scanner also comes with a specialized hinged lid. This allows the user to scan thicker books, magazines and 3D objects better than other non-hinged scanners. Based on Visioneer's innovative OneTouch technology, the OneTouch 7300 USB scanner comes with five buttons to scan, copy, OCR, email, and perform custom tasks. The buttons are pre-configured at the optimal settings for these most common tasks, enabling first-time users to begin scanning immediately. Visioneer scanners with OneTouch technology are designed so that pressing one button takes the user all the way through the scanning task, not just launching the program. Advanced users can quickly learn to customize the buttons for even more power. Have owned 4 flatbed scanners up til now, 3 of which were visioneers. 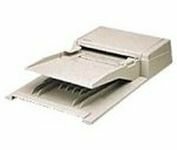 I use these scanners for archiving books and magazines. 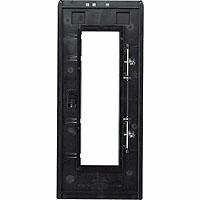 The 7300 good features: small, slim design. Easy to use for scanning books and magazines. USB powered. THE BAD:I scan all my images at 300 dpi and 8.5 x 11 inches. The 7300 took over 60 seconds to scan a color page (grayscale is about 25 seconds). In contrast, my previous scanner, a visioneer 9320, did a color page in 25 seconds. Also, it saves everything in .max format (in its paperport software), a format only paperport can use. You can convert it into jpeg format but that is just an extra step to do. I use adobe elements to edit the scan and it doesn't recognize the .max format so every scan has to be converted. So I sit a press the enter key = to the number of scans I made. It's operation was quiet except for an annoying squeaking and popping sounds it randomly made. I literally scan thousands of pages every week so speed is important. 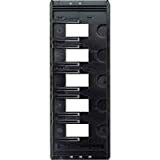 MY RECOMMENDATION: I have owned a visoneer 9320, 7300, a HP 2400 scanner and a visoneer 7100. 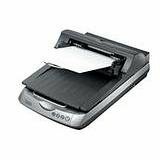 The best one is the visioneer 7100 -- Has decent scanning speed, color or grayscale and the scans can be made in bmp format instead of the paperport max format. Adobe elements can open bmp format and when I use elements to convert to jpeg, the pictures, in my opinion, are better looking. 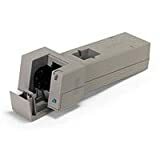 All scanners wear out at 25,000 to 30,000 scans (the glass "wears out" with minute scratches on its surface and effects the scan) so if you scan alot of pages, like me, the $50-60 cost of the 7100 is easy on the wallet. had it for a year - very good scans, much faster than budget Canon scanner and feeds itself from one USB cable. Software is easy to use, again better than Canon that died after 3 years of use. I knew that Visioneer had a bad reputation, but when my HP scanner finally died after six years, I picked this one up primarily because I had an Office Max gift card and that's all they had in this price range.The software installation bluescreened my computer in Windows XP - twice. I tried to run the software anyway and found it confusing and hard to use.It's going back to the store.Look at HP - I've had pretty good luck there - or Canon, which is what I'm going to buy once I get my money back.Visioneer has worked hard over the years to earn its lousy reputation - save yourself the trouble of finding this out for yourself. UPDATE: I researched a bit and found that Visioneer's software will not work with Windows SP2!On their site they advise that you do a full deletion of SP2 and then install their software.Make sure they've updated their software or offered a patch if you want this scanner, but since SP2 has been around a while, it tells you something about this company, doesn't it??? I am a computer technical support professional and have installed many scanners.The OneTouch 7300 by Visioneer is ideal for WindowsXP users that want a portable scanning solution.It is easy to install and quick to use.Unfortunately Visioneer did not test the Windows 2000 drivers and it is impossible to install the scanner drivers that are sent with the machine.After several attempts and after receiving fatal error message each time, I attempted to find tha answer on the Visioneer website.The support page had new drivers listed, but said that you must install the shipped drivers (not possible with Windows 2000).Then I called tech support, and am still on hold, 45 minutes later and no answer, and to top it off it is not a toll free call.While waiting the hold message states to visit their virtual tech support agent "Sara".That was completely useless.So be warned if you are trying to install this printer on any computer not running WindowsXP. 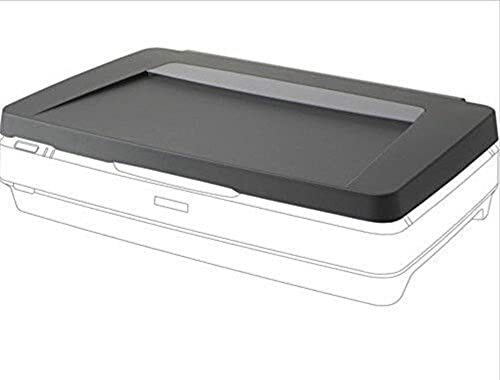 Designed to be at home in any office environment, the Xerox DocuMate 520 single-pass flatbed scanner offers 600 x 1,200 dpi resolution, 42-bit color, and fast USB 2.0 connectivity. It has an auto document feeder that's able to handle up to 50 sheets of 18 lb. paper at a time, allowing convenient scanning directly into PDF format at up to 10 pages per minute (at 200 dpi, black-and-white). Able to handles originals ranging from4.5 by 5.5 to 8.5 by 14 inches, the auto document feeder helps speed up any office environment by letting you batch-scan items as small as checks or index cards, as well as legal sized documents. The DocuMate 520 is clearly designed for office document support and comes bundled with a comprehensive package of advanced software tools that will help you streamline file management, text editing, image enhancement, single-button PDF creation, and more. 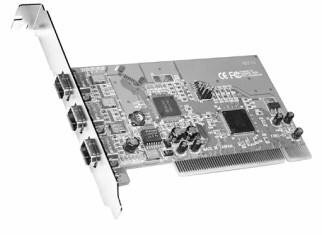 It has a certified ISIS driver for compatibility with ISIS-based imaging applications, and it is at home in any Windows 98SE, 2000, ME or XP environment. I bought this card thinking that it's SIIG Firewire Home Video Editing Kit. But when I received the card I realized that it'sIntek21 packaged card. SIIG Home Editing kit packages ULead Video Studio 6.0 basic version and costs 15$ more. Intek21 packages Ulead 4.0 Basic. Software upgrade is I think, worth more than 15$.